This mini-FAQ contains a lot of information, including extensive discussions on: (1) the modem hardware (and the items bundled with it, such as the pack-in games), (2) the file sharing features of GB KISS (which doesn't necessarily require the modem, and includes sharing text messages as well as game data), a brief look into the catalog of GB KISS games, and (4) a look at what makes a GB KISS cartridge special. Ooops, I forgot about the most important thing... in an effort to keep this article as confusion-free as possible, please familiarize yourself with the handy glossary of GB KISS terms, since you may already be wondering what, if any, difference there is between GB KISS, GB KISS LINK, GB KISS MAIL, etc. Finally, to round things out, the success and / or failure of GB KISS is considered. An infrared modem that allows you to transfer game data between a Gameboy cartridge (GB KISS compatible) and a personal computer ( PC Windows 95 ) ...who knew? GB KISS LINK came with two 3.5" floppy diskettes: GB KISS utilities / drivers on the first, and 29 mini-games ( ? ) for Gameboy on the second disk (not pictured). transfer data (i.e. game save states, custom maps created with the map editor, exclusive content downloaded from Hud- son's website, etc.) between their PC and Gameboy cartridge. Yes, you heard that right... the original 1989 Gameboy, which was considered ancient technology well before 1998, was still getting innovative (others might call it "gimmicky" ) software and hardware support whilst other, less fortunate handhelds (i.e. NEC's PC-Engine GT, Atari's Lynx, Sega's Game Gear, etc.) had long been abandoned in the graveyard of gaming devices. Speaking of ancient technology, Gameboy Color was released in 1998, the same year as GB KISS LINK and Nectaris GB. It was the first (and only) Gameboy design to feature an infrared (IR) communication port. When I first heard about file sharing via GB KISS, I assumed it was designed with Gameboy Color's IR port in mind. Then I realized that Nintendo did not release Gameboy Color until October 1998 (seven months after the release of Nectaris GB and the GB KISS LINK). 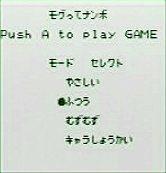 Then a friend told me that the Japanese version of Pocket Bomberman (which was released in December of 1997) featured GB KISS functionality as well.... Well, it was at this point that I knew that I was totally confused: how exactly did GB KISS work, since the original Gameboy (and 1996's Gameboy Pocket update) did not have an infrared (IR) communication port? LEFT : Infrared (IR) communication port built into the top of all GB KISS cartridges. RIGHT : Positioning Gameboys for a GB KISS file transfer. They must be no more than 1 centimeter apart, hence they are "kissing" each other. Yay! All the evidence ( page 41 page 42 ) points to one solution: GB KISS games have an IR port built into the cartridges themselves; this allows GB KISS games to fully function with any Gameboy handheld (GBA SP, GBA, GB Color, GB Pocket, GB original, etc.). However, the GB KISS features may be incompatible with Super Gameboy (i.e. the Gameboy adapter for Super Famicom / Super Nintendo -- a Japanese site noted this incompatibility, but I have yet to verify it) and / or Gameboy Player (i.e. the Gameboy adapter for Nintendo's GameCube). Still, I am confused: being the nerd that I am, I inspected my Nectaris GB cartridge very carefully and found no evidence of an IR port (in fact, the cart's external appearance was identical to that of a standard, generic Gameboy cartridge). When I get a chance, I am going to open the cartridge. That should set the record straight. Also, once I acquire a second copy of Nectaris GB, I will be able to test the GB KISS features first hand. It is very easy to get confused with all the different features of GB KISS and the terminology applied to each of them. This glossary is my attempt to define some general terms in a simple, straightforward manner. To get a feel for the more nuanced and finer details of GB KISS, please read the entire mini-FAQ. 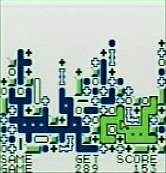 "GB KISS" is a term created by Hudson Soft, and yes, it implies that two Gameboy cartridges are "kissing" each other--but instead of exchanging saliva, they are exchanging data. "GB KISS" is a broad term that refers to "wireless, infrared file transfer." It is most commonly used in reference to cartridge <--> cartridge file sharing, since that was the most common applica- tion of GB KISS technology (i.e. 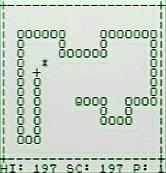 sharing user-created maps from Pocket Bomberman or Nectaris GB ). 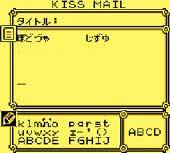 (sharing data), hence "GB KISS"
All GB KISS games included a utility for managing and transferring files (both game data and text messages). Each GB KISS cart allocated six memory slots for game data (i.e. save states, user-created maps, con- tent downloaded from internet) and 18 slots for text messages. Yes, that's right, with "GB KISS MAIL" you could compose text messages (both kana / kanji and Roman alphabet available) and manage your mailbox. Then, with GB KISS, you could send (and receive) messages from your friends. GB KISS MAIL: Compose messages & manage mailbox. PC and cartridge are "kissing"
The GB KISS LINK modem came in a thin plastic envelope that snapped shut with a cute yellow button. A 9-volt battery (not pictured) would rest on the IC board below this yellow button. 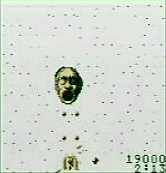 The image on the far right reveals an unidentified item, located directly above the GB KISS LINK, that I have not seen in any other picture nor mentioned in any document. LEFT : GB KISS LINK without its' protective case (female parallel port connector is in upper right corner; black plastic compartment for 9-volt battery is empty). 3.5" floppy diskette containing the drivers / utilities that had to be installed on the PC. 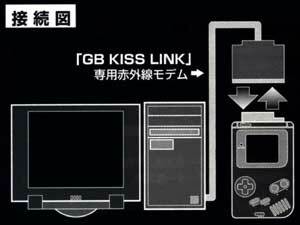 RIGHT : During use, GB KISS LINK remained in its' protective case. Here we see a parallel port cable connected to GB KISS LINK. This modem used a 9-volt battery ( on the right, under the yellow button ). This screenshot of the PC utility is not particularly helpful. Since I don't possess the GB KISS LINK modem or any of its documentation, I am hoping someone else will be able to fill in the gaps. I have been trying to get my hands on this item (or anything related to it) for years, but they are difficult to come by. For example, I have yet to see GB KISS LINK listed in any US, UK, or Japanese online auctions. If you can help me out in any way, please contact me. As I noted in the previous section, the GB KISS LINK modem was bundled with two 3.5" floppy diskettes. 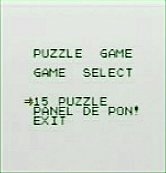 The second disk contained 29 mini-games for play on the Gameboy (I have yet to verify that the 29 games were all unique and not simply variations). The mini-game disk is never pictured in the promotional photos, which is odd because companies usually want consumers to feel like they are getting their money's worth. And "getting your money's worth" was the very reason Hudson included games in the GB KISS LINK bundle -- so gamers would actually be able to use their new modem immediately (assuming they had at least one GB KISS Gameboy cart, that is). How lame (and disappointing) would it have been to get the GB KISS LINK and not be able to use it because you have no files to transfer (especially fresh, new content)? Ultimately, I do not think Hudson created a lot of web-exclusive down- loads for games, so the pack-in games served an important function (i.e. at the time of the modem's initial release, perhaps there were 1-3 downloads available, although I can only confirm one for Nectaris GB). Not that the pack-in mini-games were stellar, mind you, but at least they provided a pretext for actually using the modem to obtain new content. 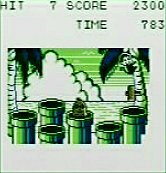 Plus, once a mini-game was saved onto a Gameboy cartridge, you could use GB KISS to share it with your friends (again, assuming they owned at least one GB KISS cartridge). 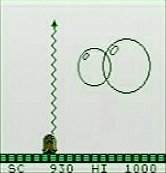 I don't have info on all 29 mini-games (if there actually were 29 unique games, that is), but I was lucky enough to find a handful of reviews and screenshots from a Japanese website -- S. Noddy's Homepage . Many thanks go out to S. Noddy ( I dig that picture of him ! ) for documenting these games and providing great screenshots! 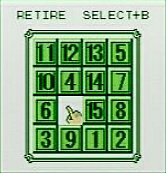 The six GB KISS mini-games profiled below are CANNON BALL, SAME GAME KISS, MINI STASOL, PUZZLE GAME, WORM and ??? ( モグってナンボ、オヤジでドカン ). CANNON BALL is a clone of Capcom's Buster Bros. (a.k.a. POMPING WORLD in Japan). In this version, though, your character's sprite looks like a ... ? 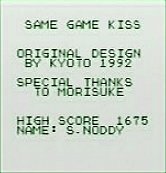 SAME GAME GB KISS is a simplified version of Hudson's own game (a series of games, in fact) which itself is a commercialized version of PC freeware. I read that the PC freeware version had been a craze in Japan. MINI STASOL is a vertical shooter of sorts. Remember, Hudson gave us the "Star Soldier" series, which this mini-game is based upon. Get it? STAr SOLdier. モグってナンボ、オヤジでドカン Bizarre... a boy (or monkey?) climbing a palm tree (upper right) and a vegetable ducking into a sewer pipe a la Mario Bros. Wait! That's the same running vegetable featured in CANNON BALL. WORM Well, you should know this one. 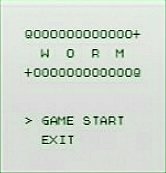 At least the other mini-games listed above use sprites, WORM is an ascii text game. Anyway, here's how the pack-in games worked: First the mini-game files from the second floppy disk were saved onto a PC. 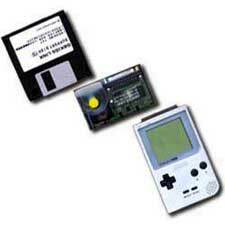 Then these files were transferred, via the GB KISS LINK modem, to a GB KISS Gameboy cartridge. It is not entirely clear how this works, since the mini-games would require some of Gameboy's RAM -- RAM which, presumably, is already being used by whatever game is residing in the Gameboy at the moment. Also, how would one access these games? 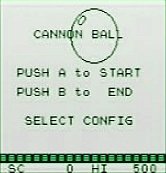 Transferring and storing a file into a cartridge's memory slot is one thing, but accessing / playing a mini-game requires a user interface (i.e. menu), among other things. TRIVIA : Hudson will recycle some of these mini-games as cell-phone games. Beginning in 2000, Hudson shifted a lot of its energy and resources into "mobile gaming" and developed a new business plan that focused on providing cell phone content for gamers on several platforms (initially, on the i-appli java-based cell phone platform and then branching out to other, newer formats, such as VODAPHONE). Hudson would eventually port faithful versions of its' PC-Engine HuCard catalog to cell-gaming, including Nectaris, Bomberman, Super Star Soldier, China Warrior, etc. The second part of this mini-FAQ moves beyond the hardware itself and examines how file sharing between cartridges (and PCs, and the internet) is accomplished with the GB KISS utilities (i.e. GB KISS MAIL). 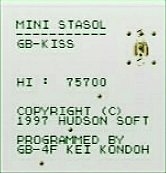 The commercial success (or failure) of Hudson's GB KISS technology is discussed, followed by a brief look into the catalog of GB KISS titles in Japan and North America (only one GB KISS game was released in North America -- ROBOPON on Gameboy Color). COMMERCIAL FREE. Reject all profiteering from & commercializing of information." Information wants to be free -- commercial free. " Peace.